June, July and August will be the monsoon season and trekking during this time can be quite miserable as there can be extremely heavy downpours, and not just for an hour or two!!! The months of October and November are peak trekking season in Nepal: temperatures are mild, the weather is relatively stable, and the clear air makes for superb mountain views. The high mountains are still cold and and lower elevations are still warm but the daytime walking temperatures are the most pleasant overall. Bad weather can hit any time of year but the fall has the most reliable conditions. The fall season is also when Nepal receives the bulk of trekkers. The most popular trails, such as Everest Base Camp and the Annapurna Circuit, are bustling with trekkers and this is felt from the trails to the teahouses. The Thamel district of Kathmandu will be full of tourists and guides charge at their highest rates during the fall peak season (although hiring a guide is relatively cheap any time of year). The second most popular time of the year for trekking in Nepal is from late February through April. The spring temperatures are similar to the fall and the trails are less crowded, but there is slightly more haze and precipitation. This means that in the spring you will need to reach higher elevations for clear mountain views, usually around 10,000 feet and above. Precipitation levels increase as the spring progresses. The shoulder seasons can be excellent, particularly the second half of September and early December, but they are also more good views during a trip. If you’re lucky, you will experience peak season conditions with only a fraction of the trekkers. If the monsoon lingers or the winter arrives early, the weather won’t be nearly as pleasant. December is normally dry, stable, and clear, but also cold, especially at higher elevations. By mid-December high elevation trekking becomes treacherous and many teahouses close. During the winter the mountain passes may require technical equipment and experience. 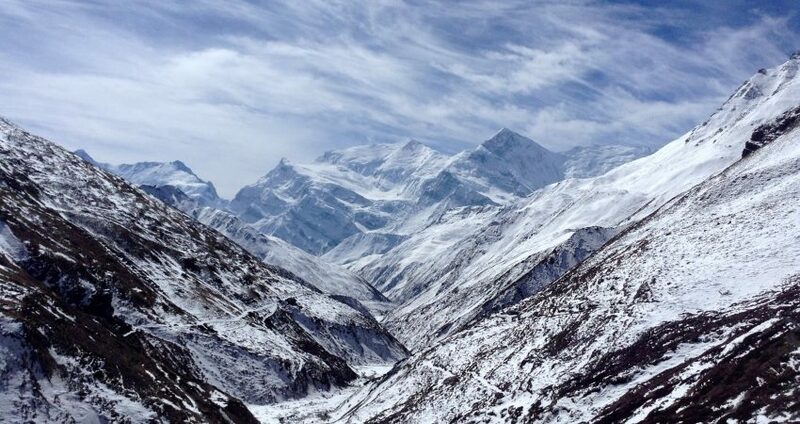 The summer from May through August generally is a less time to trek in Nepal (lower elevation hill treks and the drier Mustang and Dolpo regions can be exceptions to the rule). Significant heat and moisture rise up from the Indian Ocean, bringing hot temperatures, clouds, haze, and rain. This blocks the views, creates messy trails (with leeches), and leads to significant problems with ground transportation. The peak of the Monsoon season occurs in July when the weather begins to taper off into the drier fall period. Everest base camp trek this beautiful hiking in Nepal cheap and easy trail, Everest Base Camp Trek is designed by Nepal Guide info Team for those who wish to experience adventure travel in the Himalaya of Nepal in budget and cheap . Starting from Lukla, the trek passes through Sherpa villages, Sagarmatha National Park and Tengboche Monastery, the highest monastery in the world, and finally conceding at Kala Patthar (5,550 m/18,204 ft). You can enjoy the unimaginable view of Mount Everest and many other renowned peaks of Khumbu valley from the close proximity of Kala Patthar. The trek begins from Lukla 2880m, a Sherpa settlement known as the ‘Gateway to Mt.Everest’. Following your experienced guide, trek through the valley of Dudh Koshi to Namche Bazar. Namche, a bustling trading hub filled with upscale mountain lodges, bakeries, shops and internet cafes, resembles an amphitheater carved on the sides of the mountains. Spend a day here acclimatizing before heading to Tengboche, Dingboche, Lobuche, Gorak Shep, and finally to Everest Base Camp. Challenging hikes to Kala Patthar and Nangkhartshang Peak will test your endurance level but reward you with close up views of Mount Everest, Mount Pumori, Thamserku, Imja Tse/Island Peak and several others. However, the highlight of the trek is the visit to Everest Base Camp. Surrounded by tumbling glaciers and giant walls of snow and ice, the place is the first campsite for climbers trying to scale Mount Everest. •	Airport pick up / drop off by private vehicle as per the itinerary. •	Kathmandu – Lukla – Kathmandu round trip flight fare. •	Domestic airport departure tax. •	All accommodation during the trek at guest houses/lodges. •	Sagarmatha National park entrance permit and fees. •	Local government tax Per person 2000NP . •	First aid medical kit. •	International airfare and travel insurance. •	Tea/coffee, hot chocolate, boiled water, bottled water, cola, beer etc.